As much as antivirus and anti-spam tools are important, a firewall is essential. A firewall and router is as important to your business’s data as having a lock on your front door. Intrusion detection can help stop threats before they get through. Despite your firewall being firmly in place, there are going to be intrusion attempts. Good intrusion detection features add a layer of security to your firewall. Content filtering keeps your network safer. It also helps with employee productivity as well as helps prevent threats that often accompany pornographic sites, gambling and gaming sites, and the like. There are significant benefits to adding content filtering to minimize threats. Not only is it a good idea to avoid threats as much as possible but it’s also helpful to understand what your threat management solution is doing. Reporting can help you gage the threat levels as well as see what’s happening internally, too. Reporting via a good threat management solution can help keep your team accountable as well as help you fine tune internal IT processes as well. It’s not necessary to buy multiple tools to accomplish all of the above. The idea of multiple expensive threat management tools is what puts many small businesses at risk. You can get it all in a single affordable tool that helps you stop spam, malware, adware, Trojan horses, harmful surfing on company equipment, data loss prevention, privacy and security compliance for sensitive clients, and more. 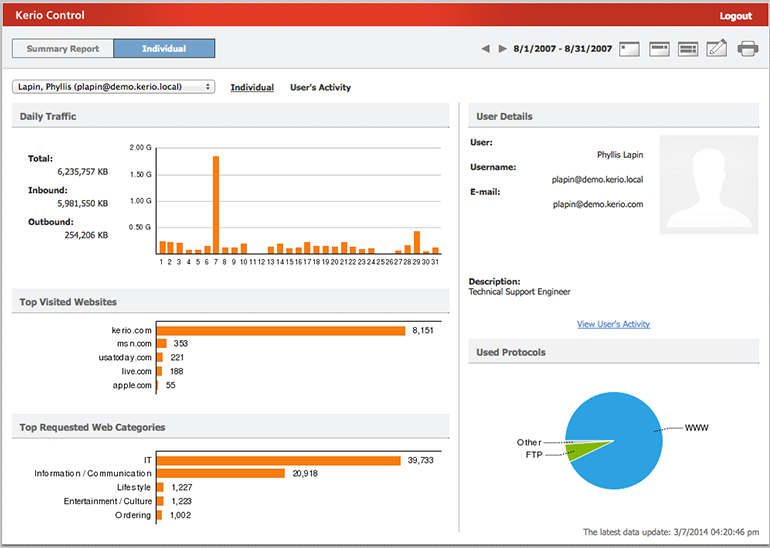 Kerio Control is a simple to manage and easy to implement highly effective unified threat management solution that can help small to medium-sized businesses in a variety of ways, including all of the above, and more. Check out this IT threat management solution from GetSync’d. This solution comes as a convenient virtual appliance.